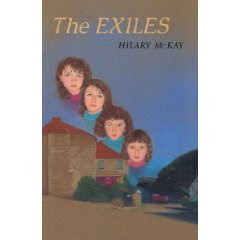 The Exiles by Hilary McKay. Margaret K. McElderry Books, a Simon & Schuster imprint. 1992. Review copy from library; review originally appeared at The Edge of the Forest. In classic tradition that dates back at least to Little Women , The Exiles is about four sisters, the Conroys: Ruth, 13; Naomi, 11; Rachel, 8; and Phoebe, 6. I'm not sure why four is the magic number; but it's proven true as recently as The Penderwicks . The girls are unique, independent and delightfully real in their sense of honor and morals. Early on, one of their younger sisters has gotten in trouble for something and is obediently waiting to get punished. Her older sisters "looked at her in despair. They believed in behaving as though they were innocent at least until they were proven guilty, and quite often even after that." Ruth and Naomi are not saying to lie or be obstinate; rather, they are saying why give in so easily? Why, just because you're the child, accept the adults' version? Why not stand up for yourself and your view of events? They despair not at their sister's obedience, but rather at her not asserting herself and her voice. The Conroys have real sister dynamics: there is love, companionship, and affection, but also arguments, selfishness, snark, and even fistfights. These are not idolized or glorified children. They delight in each other, and a good story. The girls are quite content at home, and as can be imagined by their motto of "behave as though innocent," get into some interesting situations. Then comes one of the more innovative "get the parents out of the picture" devices; no dead mom this time, rather, the parents get an unexpected inheritance, decide to remodel, and send the girls to their grandmother's for the summer. It's an indication of how well the girls think of themselves and their place in the family that each girl assumes that she will get a share of the inheritance and each is bitterly disappointed and betrayed to discover that their selfish parents don't intend to share it. The girls are in for a surprise; "Big Grandma" has decided that the girls read too much, live too much in the world of books, so for an entire summer has banned the books. She insists she has none of her own. This would have been a nightmare for me, as a child and now; and I sympathize with the girls who have nothing to read. "Big Grandma" has decided that she can "fix" the girls; but the girls prove too creative and innovative. Despite the initial antagonism, the girls and their grandmother grow close; eventually, "Big Grandma's cooking stopped tasting like an outsider's cooking and became ordinary." McKay does a great job of capturing childhood and children with all their warts; the girls continually assume that they are right and correct about everything. They are casual about the truth, especially when it serves a greater good. In supporting their attempts at fire-building, they make a casual lie about having learned how in the Girl Guides. Casual, because they are convinced that having read about it in books, they can in fact build a fire. So it's not really a lie. It is perhaps this belief in "If I read it, I can do" that has inspired "Big Grandma" to do away with books for the summer. The Conroys' stubborn insistence that they are in the right can lead to adventures; but these are not over the top adventures. They are summer time adventures: a visit to a neighbor, swimming at the beach, gardening, hiking. The adventure comes from the imagination learned from books combined with confidence that it will all work out the way they want it to. This can be for the good or the bad. The girls go to visit a cave, and Naomi freezes on the way up the side of a cliff, afraid she'll fall. Later, determined to do what her sisters did, Naomi visits the place on her own, determined to conquer her fear. She does so; but she also falls. As she falls, "she felt vaguely triumphant; she'd known she would fall and she had fallen, so she had been right all along." The brilliance of McKay is that a less honest writer would have had Naomi conquer a fear of heights; instead, Naomi discovers that her fear was not unfounded or silly. Not only that, but Naomi is triumphant in that knowledge. The Conroys remain, as ever, confident in their knowledge that they are right; so continue to behave as though innocent. It's the fishing in a bucket scene that keeps me recommending this book (and its sequels). I laugh out loud every single time and look around desperate for someone to read it out loud to. I came to leave a comment about the fishing in the bucket bit too! I love that bit with all my heart. I loved The Exiles right up until the horrifying disaster at the end. I was heartbroken. I can't reread it. Instead I go straight to The Exiles at Home. You'd think with her Casson family books doing well, they'd come up with some new covers for this series. I'm convinced they're the reason the books don't get checked out as often as McKay's others. Sigh.